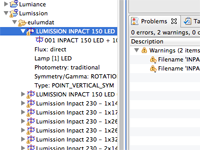 Quickly calculate required number of luminaires. Choose from 50 suggestions. Manage, verify, convert and edit Eulumdat and IES photometric files. 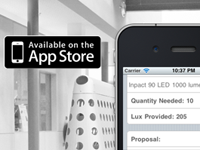 Calculate required number of luminaires on you iPhone or Android. 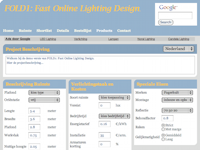 Automatic and easy luminaire selection and quick lighting design calculations for indoor lighting. Lighting calculations on iPhone, iPad, Android for Concord Lighting, Lumiance, Sylvania. For more information see here. Available from WAC Lighting is an online Lighting Estimator that allows you to quickly calculate simple fixture layouts, also using our technology. Eulumdat Tools is now also available as a stand-alone package for Linux. Please download from here. To facilitate new users of Eulumdat Tools we have started a blog specific to the use of this Eclipse based toolset for managing, editing and verifying large stes of EULUMDAT files. The blog is named eulumdat.blogspot.com. First time | More explanation | Try now!